That’s a solo salad. One that I ate by myself today at lunch. One that followed a craving that started when I woke up this morning and that never ended until my imaginary salad landed on our table. In fact, I created the salad, lunch, while running this morning. 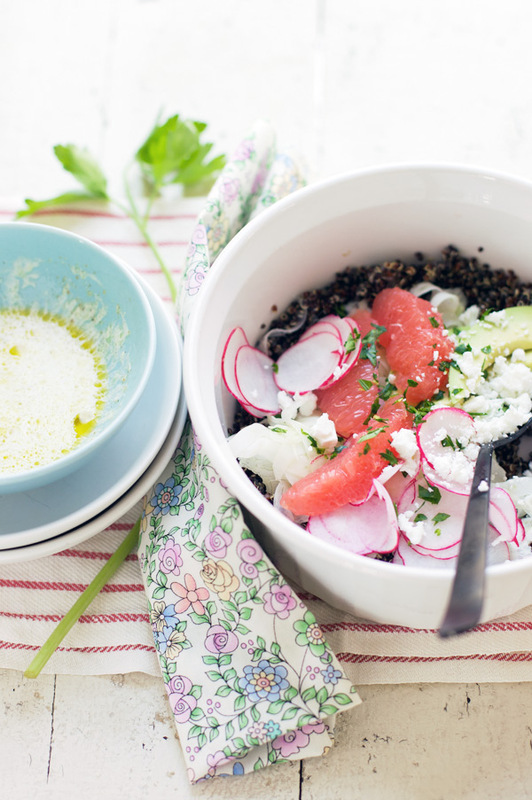 It resonated with black quinoa, vitamins, grapefruit, vegetables, fennel, radish, refreshing and crunchy. My salad gave me all of these things. And I felt blessed. For the run. My craving. And my vitamin-boosted lunch, as I liked to call it. Nourishing my body and my soul at the same time. Which, I must say, was quite welcoming after a night with little sleep during which we looked after our sick sweet Lulu. Try the salad! Really. Even if you find yourself alone at lunchtime, at home, or to pack for the office. And by the way, you might also like this other black quinoa salad recipe. Rinse the quinoa and cook it with a kaffir lime leaf, covered, in 2/3 cup salted water. When the water is absorbed, stop eht heat and let rest for 5 minutes. Fluff with a fork and transfer to a bowl, discarding the kaffir lime leaf, to leave to cool. 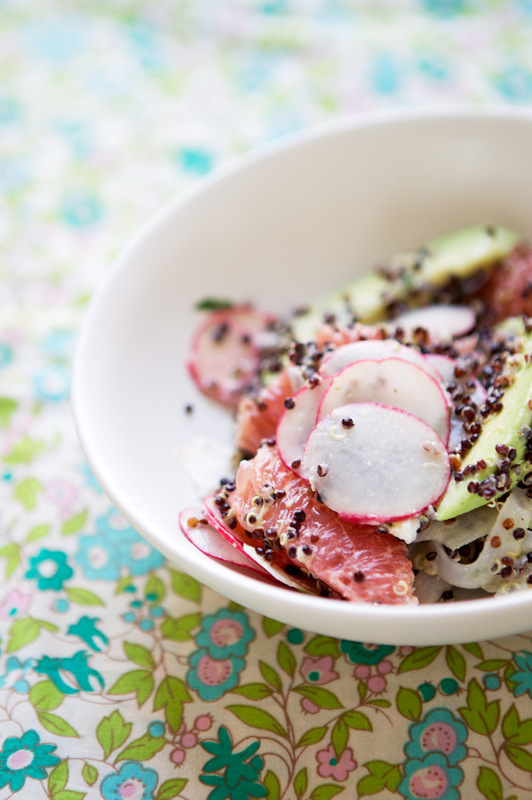 In the meantime, in a large bowl, combine the slices of grapefruit, avocado, fennel, radish and toss gently. Make the dressing by adding ingredients in this order: salt, pepper, lime juice, ginger, olive oil. Emulsify with a small whisk and finish with the heavy cream; keep aside. Rinsez le quinoa et faites-le cuire à couvert dans deux fois son volume d’eau salée (environ 12 minutes). Ajoutez-une une feuille de kaffir pour parfumer le quinoa. Au bout de ce temps, l’eau doit être absorbée. Arrêtez le feu et laissez reposer pendant 5 minutes. Puis transférez dans um bol après avoir retirer la feuille de kaffir pour laisser complètement refroidir. Pendant ce temps, dans une jatte, mélangez les tranches de pamplemousse, se fenouil, s’avocat, et de radis et mélangez délicatement. Préparez la vinaigrette en ajoutant les ingrédients dans cet ordre: sel, poivre, jus de citron vert, gingembre et huile. Faites émulsionner et ajoutez la crème; réservez. Ajoutez le quinoa, la feta (au goût) et le persil aux légumes et fruit. Assaisonnez de vinaigrette et servez de suite. it looks delicous! a run how great in the fresh air. i hope lulu feels better soon! Salad looks divine. I’m curious to know what “vitamins” you added?? I would love to have this salad in my lunchbox! – will definitely try it. I hope Lulu will get better soon. I love your salad. Hopefully I can find some black quinoa, if not what would you recommend to replace it with? This salad sounds so amazing! Hope Lulu is feeling better soon – there is nothing sadder than a sick child. That looks so refreshing and very pretty and I’m sorry you didn’t get enough sleep. We’ve been going through that for a couple of weeks. Exercise, good foods are the perfect prescription for staying well this time of year. Spring, where are you? Hope your bébé gets well soon. Delicious! Hope Lulu gets well very-very soon! Courir en inventant le repas du midi, ça c’est une idée ! Il faudrait que j’essaie, ça me motiverait peut être ^^ En tout cas c’est très réussi ! 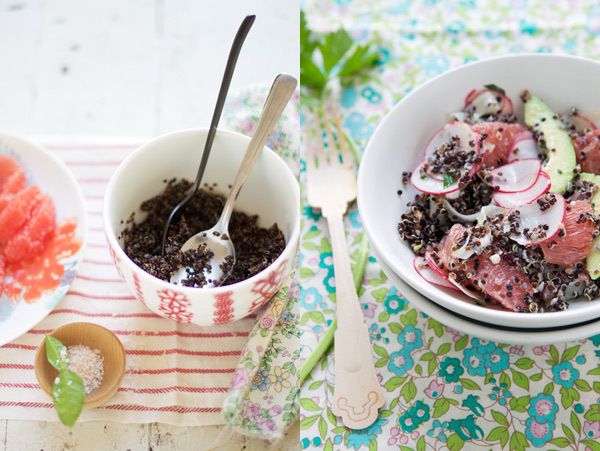 It’s lovely how the black quinoa pops against your crunchy salad’s backdrop. 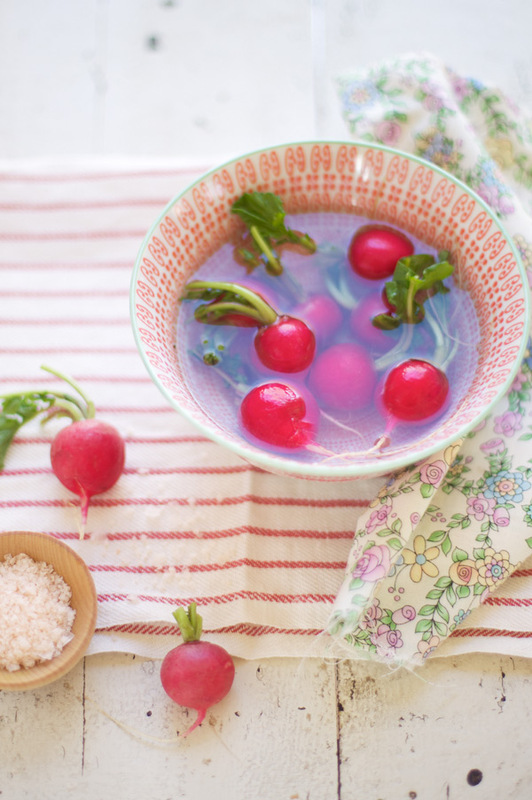 I recently came across some watermelon radishes: I imagine they would feel quite at home in this recipe! Quinoa … such a great source of iron too! Hope Lulu feels better soon. Where do you find the kaffir lime leaf? I also live in the Boston area and could not find it or the mace you used in the root vegetable soup a few posts back. I checked at my local grocer, whole foods and the fruit center. Thanks! 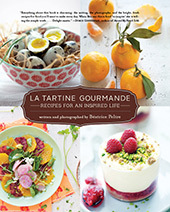 My daughter and I love your blog-the recipes are delicious and the photos are stunning. Thanks so much Julia. You can find Mace at Formaggios’ in Cambridge (where I bought mine) and I find (not always available, but always ask the person on staff) at Whole Foods in Fresh Pond in Cambridge too. Asian stores (like in Brighton) should always carry it. In Chinatown as well (although I understand that this can be a hike to get there with a child!) Good luck. And thanks again. I bought the fabrics in a fabric store where I live (sorry not online). You can use white quinoa if you cannot find the black one. I will have to add, though, that the black variety gives a welcoming crunch that the white variety doesn’t. Red quinoa would also be another great option. No vitamins added beside the vitamins and nutrients that the salad offers naturally. Thanks so much everyone. Valérie-Jeanne, oh yes, now where is Spring indeed? Time to switch seasons, non? Your artful style is so unique. The dishes I love. I have always been a fabric fiend… and the way you combine the colours and shapes is so perfect and no one could do it this way but you – no one else would have that specific artful eye which is what I enjoy so much when visiting. Many have tried… and that is probably flattering and annoying to you – but, you are clearly the Master. I have been artistically fed today. Ahhh. Je suis ravie que les recettes soient aussi en français!!! Cette salade donne vraiment envie et les photos sont magnifiques! So healthy and amazing again! Elle est parfaite cette salade! Elle me correspond totalement! Moi aussi je courre mais je ne pense pas à des recettes à ce moment là, c’est une bonne motivation en tout cas! Lulu! Have some salad and feel better! Oh yum. I wish I could take this with me for lunch between classes everyday. Then maybe I’d have an easier time staying awake…! A truly delicious and original looking salad, I’d love to try this one but doubt it’ll be as beautiful as yours! This looks so delicious – I am always looking for more salad ideas so will certainly give this a whirl. Always enjoy returning to your blog, and your beautiful pictures. Bea, congratulations!!! You recipe Petits Pots de Crème (http://ginger-blonde.livejournal.com/5710.html) has became the BEST TOP 6 in our russians blog!!! Welcome in http://ginger-blonde.livejournal.com/8816.html and take your award! Thank you! Ces photos sentent le printemps! magnifique. Je dois essayer le quinoa noir. This salad scream welcome Spring! And I would LOVE to welcome Spring! Lovely recipe–always looking for a new way to incorporate quinoa into my cooking. 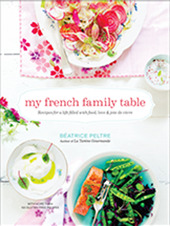 This one combines some of my favorite flavor profiles: kaffir lime, radishes, feta. Can’t wait to try it! I have not tried Black Quinoa. Lastnight we had a meditteranean with the white Quinoa, and I’m looking forward to trying the black. What interest, visually! Where do you find black quinoa? Do you know if Whole foods have it? I’m not a fan of the white stuff, but that salad looks like my kind of salad – crunchy, refreshing and with some robust flavors – je l’adore! Merci!! Lisa, yes. Whole Foods carries it 😉 It’s definitely a lovely texture. Much better than white quinoa. I’ve made this twice – it’s SO delicious!! Lovely textures and the creamy lime dressing is divine. Hope you and Lulu are feeling better soon and I so look forward to your book. I just tried this salad for the first time and it was just perfect, even though the Avocado wasn’t ready to eaten and I used an apple instead. I’m sure this recipe becomes one of my favourite salads from today on. btw: I love your pictures! J’ai seulement remplacé les radis par des dés de concombre frais, la féta par du fromage frais (assez similaire) et le quinoa noir par du quinoa rouge (bref, j’ai vidé mes placards !) : c’est divin ! Merci Christelle, je suis super contente que tu aies aimé. Tes substitutions sont excellentes et goûteuses. Ravie aussi de t’avoir donné l’occasion d’avoir un bon déjeuner! Béa, what is the name of the red flower and pink one on your photo,pls? they’re as beautiful as la petite Lulu. I tested your recipe today except for the feta and keffir lime leaf, and it was great. Indeed the black quinoa I was using for the the very first time is more crunchy but perfect for salads like this. A must do.